When Riot unveiled its new League of Legends champion "The Bard," the developer claimed that the heavily bearded fellow hailed from somewhere "beyond the physical universe in realms unknown to men." Fair enough. 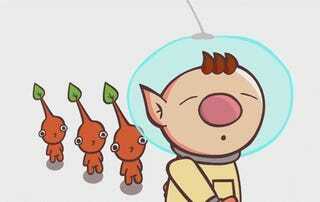 But could they be known to...pikmin? (Pun very much intended). For those unfamiliar: Pikmin is Nintendo's wonderful, peculiar, and wonderfully peculiar real-time strategy game about a group of astronauts who crash-land on a strange planet and use its painfully adorable indigenous population to scavenge for food and fight scary monsters. League of Legends' upcoming Bard champion, meanwhile, uses tiny minions known as "meeps" to take out enemies and farm experience. Coincidence?? GingerPale's cute short also reminds me, once again, that Nintendo should totally make its own MOBA. Just imagine it: the turrets could be Whomps, and the minion creeps could be Goombas! All of these things sound like great ideas.